While the technology landscape feels big, complex and colorful, the actual variation in creativity and uniqueness isn’t that huge. Often, ideas build upon other ideas, with small changes and incremental improvements. This is also true of our favorite domain, Linux, with its towering pyramid of distros and forks and still more forks, a whole cutlery division. Lots of stuff but not necessarily variety. In fact, I even believe there’s a decrease in uniqueness over the years, caused by over-saturation of ideas, the demise (or at least, the decline) of several major projects, and with them, the hope and enthusiasm, and of course, the weariness of the human intellect involved. Having inadequate resources, with teams and projects stretched thin, sure does not help. But that’s the negative side. The good thing is, alongside mediocrity, there have been some really amazing things out there, and I want to give them special attention in this article. If I’m not mistaken, Kaptan was born, created and adapted for use in the KDE version of Pardus, a Turkish distribution designed mostly for corporate use. And like all systems with some business orientation, like openSUSE or Mageia, it had several phenomenal features, one of which was Kaptan. 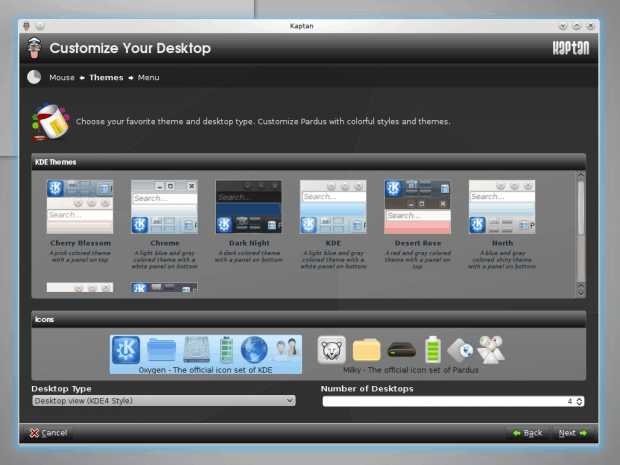 This was essentially a configuration wizard, allowing you to customize your desktop any which way you want, without having to manually dig through the menus, hunting for options and settings. Kaptan didn’t really die – and it even inspired similar configuration tools, some GUI, some CLI, in other distributions – but it did sort of fade away, and you don’t see it much lately. My last encounter with it was in KaOS 2017.11 not that long ago. For some reason, it did not catch on, although it makes perfect sense for new users switching from Windows to Linux. 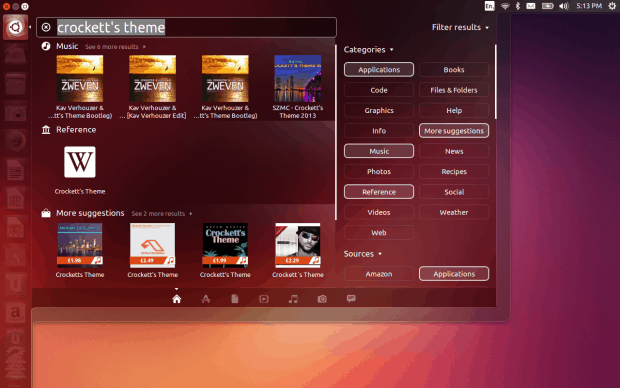 Essentially, such tools exist in many modern appliances, like smart TVs, smartphones and such, but the Linux desktop remains bereft of an easy desktop setup. This is a blast from the past. Back in 2009, I tested a heavily modified Puppy Linux edition called TeenPup, designed to be lean, frugal and yet rich in features and good looks. Well, at 700 MB compared to the standard 100 MB for the original distro, it kind of failed on the leanness front, but it did deliver a fairly pretty desktop, and more importantly, Magic Scripts. The idea behind Magic Scripts was golden. The scripts were essentially a seemingly innocent collection of icons (scripts), but they would become active if you dragged and dropped multimedia files onto them. Then, depending on the selected script, the multimedia files would be processed and converted. Even in 2009, the scripts included several mobile/touch formats, iPod, you could also split videos, and there were roughly a dozen different options available. Rather than manually opening media processing tools or using ffmpeg, which is a program for skilled nerds, you could drag ‘n’ drop music and videos clips and watch the magic happen. And it did happen. Again, much like Kaptan, the Magic Scripts seem to have vanished. In fact, worse than Kaptan. This was a true one-hit wonder. Along with this gutsy little distro, the scripts vanished and never came back. But they make a lot of sense, and also emphasize that it is possible to create simple, elegant solutions without going overboard. Alas, not replicated, for now. A lightweight distro named MX Linux has been making the headlines recently. Its heritage is quite complex, unless you know what sidux, Mepis, and AntiX are. But never mind that. 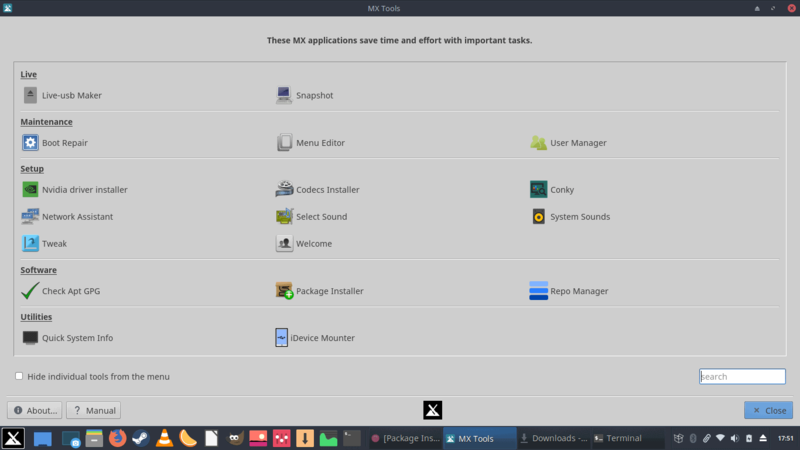 MX Linux is a resource-spartan distribution, normally cloaked in Xfce, and it has grown and evolved from an unruly second-grade player into a top-notch desktop with a wealth of friendly features for the common desktop user. Speed, consistency and ease of use, along with even more focus on aesthetics, plus a very nice installer that will fully preserve all live session changes and port them into your installed user directory. 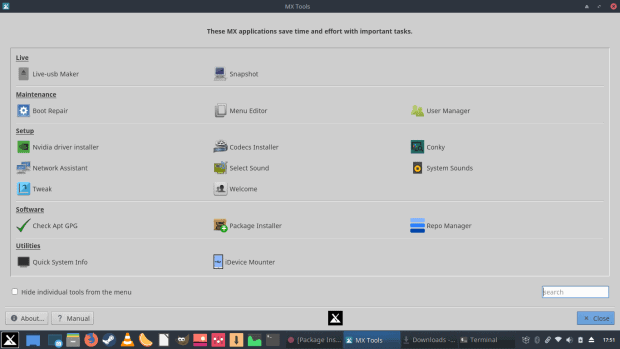 However, the cream of the crop is a set of tools called MX Tools, a bundle of utilities unique to this distro, and designed to make your desktop use and maintenance, especially if you’re a newbie, much easier than most rivals. We’ve talked about MX Tools in the past, right here on OCS-Mag, and we will talk about them sometime soon again, but for those short in memory and patience, here’s a brief recap. Basically, once you have the distro installed, you may struggle at first. Things might look unfamiliar, or you just might not want to fiddle with system configurations. Either way, MX Tools is exactly what you need. The toolbox packages numerous utilities, including system snapshot and bootloader repair, Nvidia drivers setup, media codecs, desktop customization, iPhone (iDevice) mounting, and several other components. The idea is for the common user to be able to master common tasks without resorting to the command line, or having to go online asking for help. While not the only set available in the wider Linux world, MX Tools are special in that they are a rather complete and comprehensive set covering several crucial elements of everyday desktop usage. To the best of my experience and memory, this is the most advanced implementation of the make-desktop-nice functionality. Windows makes for 90% desktop usage – and pretty much 100% of desktop folks have used Microsoft Office at some point in their lives, or will require it. Which put Linux in a precarious position, as it does not have a native answer to this critical need. In the past few years, threatened, or let’s say, encouraged by the rise of the mobile platforms, Microsoft has become more accessible, with Office available on Android, and a free, online, cloud-powered version of the office suite called Office Online available to anyone with a modern browser, Linux people included. But … there’s no native integration. Or rather, there hasn’t been any. Until very recently. 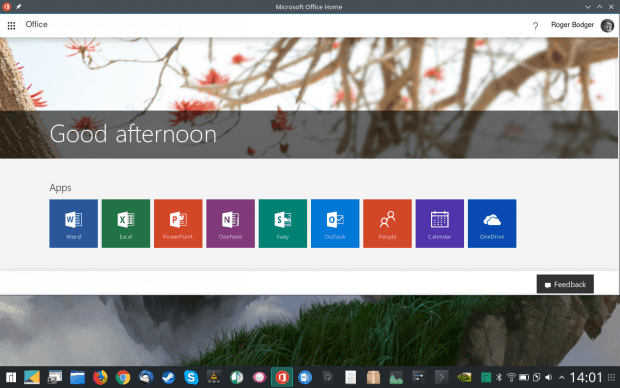 Manjaro 17.1 Hakoila seems to be the very first distribution to try to bridge the gap between the Windows and Linux world, by offering single-page browser wrapper apps for Microsoft Office Online. The basic functionality does not change, but you have the office suite programs almost behave as ordinary applications installed on your computer, complete with the menu search, icon shortcuts and all that. This being a new technology – based on the JAK framework – there hasn’t been much time or chance for it to propagate to other distributions. And it may yet do so. Or never, remaining isolated to Manjaro. While the proliferation test is still to happen, I do like this concept very much, as it puts this Arch-based distro ahead of the curve, offering something new and fresh that most Linux users didn’t really have. Again, the online access was always there, but for that matter, any which distro has everything, the difference is between hours of manual labor and having everything out of the box, nice and easy. Going back to Windows again, a cool thing you could always do, at least since Windows XP, was the ability to roll drivers to a previous version if you decided the current one wasn’t working well enough. In Linux, in general, there’s never been an option to actually roll back system configurations or tools. Technically, the kernel and the drivers are covered, but it’s an all-or-nothing situation. You either hit one line in your bootloader menu, and then everything associated with the particular kernel loads, or you you hit a different line, and a different kernel and a different set of modules loads. Moreover, the complex dependency between programs and packages creates a difficult situation when you must uninstall an app, or when you realize that there might be a software conflict. Again, without versioning, it’s hard to really do this in a surgical manner. Very often, removing a component, a library of some sort, will affect dozens of other packages. Linux started solving this – partially – through self-contained applications delivered through application frameworks like Snap or Appimage, but the overall Linux desktop is far from any standard just yet. Meanwhile, for a few years now, openSUSE has offered a very cool framework called Snapper. Snapper is a frontend for the BTRFS filesystem (once again, apologies for the acronym recursion), which has a built-in snapshot capability, on the filesystem level. The ability to create, mount and dismount subvolumes on a per-file level makes BTRFS a powerful versioning tool of its own, as you can go back and forth between system configurations, drivers or modules on a very granular level. 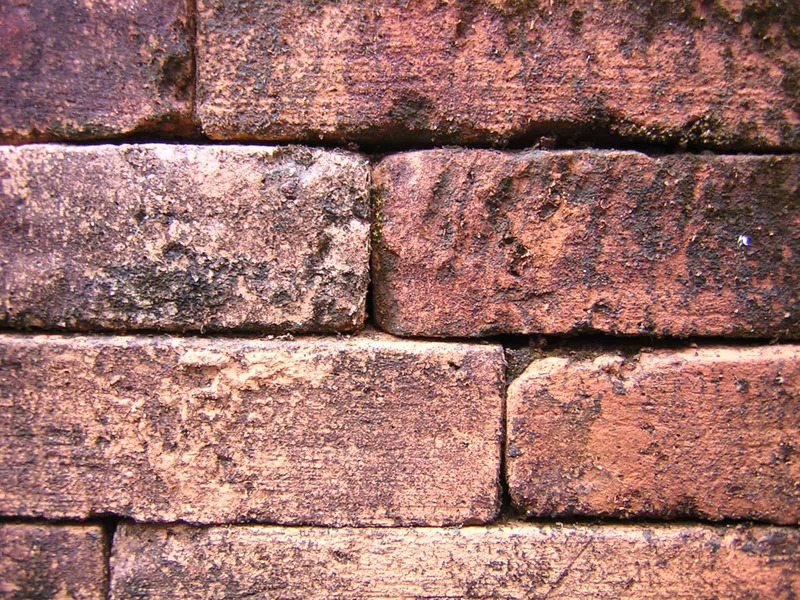 Few distros use BTRFS – for various stability and performance reasons – and SUSE is probably the only major player that consistently pushes in this direction. Moreover, and not surprisingly, BTRFS management tools are exclusive to SUSE. Snapper makes subvolume and snapshot management easier, with a simple, elegant frontend. 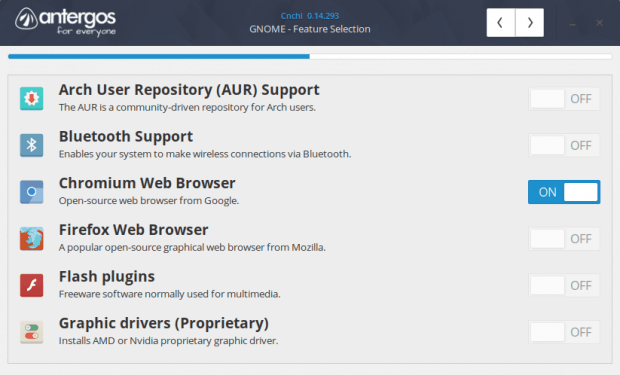 It is a remarkably advanced and flexible utility, but it has to yet to find another home apart from the lizardly reachers of the openSUSE continent. When Unity was born, Canonical made the Linux world gasp by integrating application menus into the top panel, creating a Mac-like layout and saving vertical space, something that was born in a desire to have Ubuntu run on small-form devices back in the day. Global menu is not a novel concept per se – but the way Ubuntu introduced it into Linux was. Likewise, Dash is another attempt to make a smart desktop menu, with Scopes acting as narrow-function search qualifiers, allowing users to transform their desktop into a powerful, multi-functional data portal. This was Canonical’s early experiment with what would eventually be its one venture into the mobile space. Often, mobile world ideas work horribly on the desktop, but Dash was good. You could make it behave like an ordinary menu with tiled results, or you could use it to search for music, videos, specific files or articles, other things, offline and online. Perhaps it is Unity’s complexity and uniqueness that prevented these two ideas from taking root elsewhere. And with Unity being discontinued, the chances of actually seeing this bear fruit are slim. Shame, because Canonical did create a more intelligent system menu than anything else we have today. Arch Linux normally requires their new users to drink hot goat blood, wear a helmet and have a license from the Ministry of Silly Walking before they are allowed to dabble in its internals. Some of the Arch developers figured this, and decided to make their system more accessible to the masses. And so the likes of Manjaro and Antergos were born. Technically, Arch Made Easy (AME) versions. I have tested a dozen different versions of Arch-based distros over the years, but my encounter with Antergos 17.9 left me really impressed. The installation wizard actually has a separate section that lets users decide if and how they wish to customize their desktop, with things like additional community repositories, proprietary drivers, browsers, plugins, and more. A far cry from a typical Linux desktop experience where you need to spend 15-20 minutes and 200-300 MB of data installing and configuring things after the first boot. Again, this is something fairly unique to Antergos – and alongside Manjaro, we see a great deal of creativity from the Arch community, which probably stems from the complexity of the baseline distros. Necessity breeds ingenuity. But this feature selection concept hasn’t really caught on. Bigger, DVD-size distros do offer some level of customization, but it is normally limited to choosing the desktop environment and the core set of packages. You don’t usually get more than that until after the installation. What if all these different distros actually worked together? The one common theme with all these different projects is that they are often done in isolation, and they are almost never adapted by other projects or distributions, unless closely associated with the work at hand. In a way, it smacks of the corporate Not-Invented-Here (NIH) syndrome, except it’s done without Powerpoint presentations and buzzwords. But in essence, the same happens here. I did talk about the ingredients for the ultimate distro (not the conceptual idea, the practical list) a long, long time ago, we’re talking roughly a decade back. The formula was something like, openSUSE installer, Mint codec management, PCLinuxOS software selection, and so forth. Predictable, impossible. Of course, it was wishful thinking. The need is still there. No single distro does things perfectly well. Ubuntu almost did it, Mint almost did it, Fuduntu almost did it, lots of small distros are trying, Fedora would be the ideal system, if it had CentOS stability and support and Ubuntu software. CentOS could be perfect, if it were more desktop geared. OpenSUSE could be the chosen one if blended with Ubuntu. There’s an infinite number of possibilities. These seven projects, which I truly believe are among the most unique and creative concepts born in the past decade, highlight the brilliance and despair and the utter, pointless fragmentation that grips the Linux world. It is always refreshing finding technology that works ever so slightly differently from the run-of-the-mill churn. It shows that people can think outside their proverbial box, and try to offer their users a better experience. Innovating on the desktop is hard; the concept has been around for 30 years. But it’s doable. And it would be even more amazing if these lovely projects became global. Recognized, embraced and further developed by the community. The scarcity of resources is often quoted, but it would not be so if the thousands of smart people pooled their intellect and coding skills under one umbrella. Only that’s a different story altogether, and we will discuss that separately. Meanwhile, the hunt and hope for the perfect desktop remains. I’m done writing. Perhaps you might want to comment on the special, unique projects and tools that impressed you? Cover image from freeimages.com, Krista Johanson. What specifically are you referring to please? This web page. It uses very light grey text, and the background is white. It is very hard to read. I did not read your article. My eyes hurt after the first paragraph so I quit. Thanks. Something to consider indeed. Temporarily, you can – if you want – change the default font color #3e3e3e to black via right-click > inspect. there have been some really amazing things out there, and I want to give them special attention in this article. 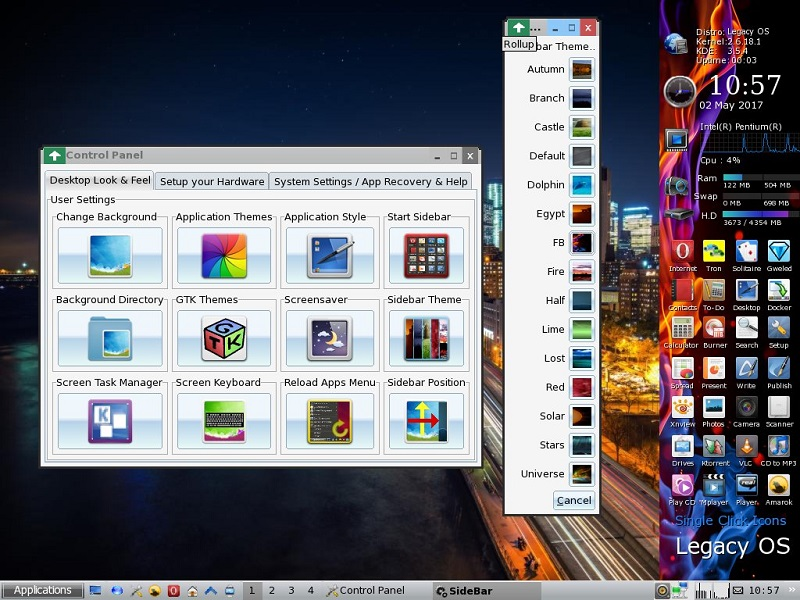 Flatpak – Standalone apps for Linux? Peppermint’s Site Specific Browsers (SSBs) and the Ice Application. https://uploads.disquscdn.com/images/035e236cbe59622d053a448d942bd6ec942fc74aaea85923625bb9e8fd1b2232.png Hello Dedoimedo, As the creator of Magic Scripts, I can tell you they continue on in Legacy OS 2017 formally Teenpup Linux. They are still very much alive and so is Legacy OS the Operating System for Pentium 3 and 4 Computers. Nice! How about you try to get this included with the big player distros, too? Because they really are cool and should see more traction. Hello Dedoimedo, first I’d like to say I was always grateful you reviewed Teenpup back in 2009. After finding this post included “Magic Scripts” as one of the best 7 ideas that should find its way into other Distro’s I’m planning to see what other processes Magic Scripts could be used for. Conversion of images etc.Once I’ve updated Magic Scripts, I’ll create a Tar.gz Package which can be used by Distro developers. I’ll also create an installable package for Puppy Linux.